There is a lot more to Va. Beach than just the beach. Our City is over 250 sq. 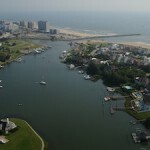 miles of countryside and the resort beaches are just a small fraction of the whole City of Va. Beach. Our City stretches from the farm lands on the Southside bordering North Carolina North and east to the Resort Beaches … and north and west to the more urban and Suburban central areas. With plenty of City and State Parks … plus the numerous rivers and inland Bay’s.. such as Linkhorn Bay, Broad Bay The Inter Coastal Waterway and the Lynnhaven River … there are plenty of outdoor and indoor activities to look into. Explore this Va. Beach City Site link .. and map out your course of activities … and enjoy the beach in the meantime. Start Living the Coastal Lifestyle …. in Va. Beach.